TICAD Ministerial Meeting (2018)was held in Tokyo from 6th to 7th October. This ministerial meeting was a pre-meeting for TICAD 7 to be held in 2019. There are so many visitors, not only from Africa but also from various countries and domestic. 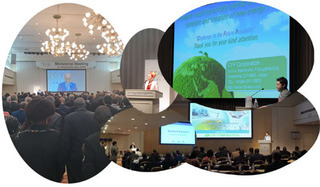 about "thought for Africa and hope for the future" as honorary ambassador of TICAD 7. We participated in the side event of Ministerial Meeting "Showcasing the Potential of Japanese SMEs to Africa"
as a speaker and presented our company's works. Our "Waste plastic to oil system" has been installed in three countries, South Africa, Malaysia and Japan. We explained these details, analysis data on the type of waste plastics used as raw material and data on the cracked oils. After the presentation we talked with the ministers of several countries. but are faced with the problem of Waste disposal, so they are searching for breakthrough measures. They are highly interested in our system to promote the recycle actively. It was a valuable experience that we were able to listen to the real voicece of such countries. And we have reaffirmed that apply this experience to future research and development.